Paperback, 8.5 x 11.75 in. / 254 pgs / 175 color / 48 bw. 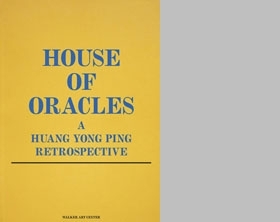 This first monograph to look back over Huang Yong Ping's work to date finally brings the full range of his accomplishments to an international audience. As a contemporary artist in China working with diverse traditions and new and ancient media, Huang has built an artistic universe comprised of provocative installations that challenge the viewer to reconsider everything from the idea of art to national identity to recent history. He was once one of the leading figures of the Xiamen Dada movement--a collective of artists working to create a new Chinese cultural identity by bridging trends in Western modernism with Chinese traditions of Zen and Taoism. He continues to confront established definitions of history and aesthetics with sculptures and installations that draw on the legacies of Joseph Beuys, Arte Povera, and John Cage as well as traditional Chinese art and philosophy, juxtaposing traditional objects, iconic images, and modern references. 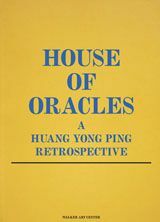 House of Oracles echoes that blend by binding photographs, essays, and striking sketchbook pages, which are presented with translations of the artist's calligraphy, in a matte soft cover with two facing spines--it opens with the plates on one side and the essays and artist writings on the other. Edited with text by Hou Hanrou. Text by Giovanna Melandri, Francesco Bonami, Donatien Grau, et al. FORMAT: Paperback, 8.5 x 11.75 in. / 254 pgs / 175 color / 48 b&w.